Green Roads CBD oil tea combines all the soothing properties of CBD and chamomile to create a therapeutic infusion rich in flavor and aroma. 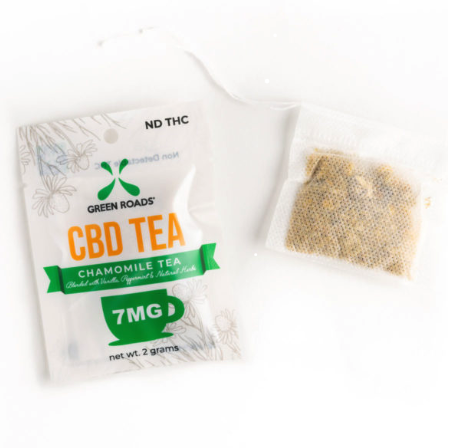 These single day packs of CBD-infused tea have been formulated to help calm your body and mind so you can get through the most demanding parts of your day. With 7 MG of CBD per individual bag, this tea offers an easy and familiar way to experience all the benefits of CBD. Just pour boiling water over a tea bag and steep for 5-7 minutes. This CBD-infused tea is made with only natural ingredients like chamomile, vanilla, peppermint, and hemp-derived cannabidiol. Ingredients: 7 MG CBD Hemp Extract, Organic Chamomile Loose-Leaf Tea Flowers and Powder, Vanilla, Peppermint.